TIP SHEET #4: Are Your Emotions Contagious? 1. Be aware of the temperament and tone of your home. “Emotional contagion” affects all human relationships, from marriage to business to professional sports. Try to under-react to your teen and not match his or her high emotional state. Try to be business-like. 2. Sometimes, creating distance can be most effective. Step back and think about the reasons for your teen’s distress and the best ways to cope with it. If you know the cause, you’ll have a better idea of what you can do to help, whether it’s leaving her alone for a few hours or making yourself available so she can vent. 3. We don’t realize we’re being influenced by others’ emotions. Interestingly, negative emotions are usually more catching than positive ones. One of the functions of sadness is to ask for help from others. Try to be tender and more attentive to your teen, even though he might be trying your patience at the end of a long day. 4. Be your family’s CEO (Chief Energy Officer). Don’t allow yourself to be overly influenced by a destructive kind of energy and then unconsciously communicate that energy to others in your home. Parents are the leaders in the home and impact the family by their moods. Negative emotions spread fast and they’re highly toxic. 5. We can’t check our emotions at the door when we walk in the house. It pays to be aware of what you’re feeling at any given moment. You can’t change what you don’t notice. You can’t fake “positive” for long, so genuine matters. 6. Embrace realistic optimism. Have the faith to tell the most hopeful and empowering story possible, but also be willing to confront difficult facts as they arise with your teen and deal with them directly. This entry was posted in Excerpts from the Book, For Parents, Tip Sheets on September 16, 2014 by Karyn Rashoff. Is Homework a Hassle in Your Home? You’re not alone: it is in many homes. Wouldn’t it be great if your teens would study independently and efficiently without you having to nag and pester them all evening about homework? Studying and homework are hot buttons for teens and parents because there’s a lot at risk concerning school and power. Try this: remove emotion from the homework issue. Yes, easy for me to say from here, but if you talk to your teen like you normally talk with your co-workers – reasonably, respectfully and calmly, without emotion – the drama is taken out of the interaction. I heard this often in my high school guidance office: “My parents treat me like a little kid; they don’t respect me so I don’t respect them.” Parents were often stunned by their teen saying this in the safety and comfort behind closed doors of an office. If you respect them, they will respect you. The best teachers I knew were ones who respected their students by giving them enough independence to learn but still guide them if they needed help. They knew their names, shook their hands and held them to expectations and stuck with those expectations. If kids know your expectations, they know what to aim for. Talk about your expectations for grades together. I knew a parent, who with all good intentions, said to her son in my office, “If you make straight A’s this semester, I’ll buy you a car.” Well… we were in my office because her son was making all D’s and F’s, so the expectation that he would earn straight A’s – something he had never done in his life – was not very realistic at all. Set realistic and attainable goals for grades together. Maybe all C’s would be realistic for him. We talked about sensible expectations, and they were negotiated nicely by mother and son. This entry was posted in For Parents, For Educators, For Students, Tip Sheets on July 20, 2014 by Karyn Rashoff. With summer vacation in full swing, your teen may look like a couch potato, letting time slip through his fingers while he meanders around the house or neighborhood with his friends. Here is one way to keep your teen engaged in learning – a fun way – during the summer: let him choose a book from a bookstore (used bookstores are great) or the library or an eBook and pay him to read it. What?? Did I say, “Pay him to read it”?? Let him choose how much; you might be surprised at his reasonable rate. On the other hand, he may want a new car for reading a book – to test you and get more information out of you. It seems that a teen tests us by pushing our buttons to see how far he can go, but it is really information-gathering. offers intellectual stimulation to keep in practice for the school year. You might want to have a little competition with your teen, seeing who can read the most books in the summer – it doesn’t matter what kind of book – just read! If you have several children, you can make a fun chart together and keep track of books read. Remember the Summer Reading for Teens Programs at the public libraries? Stop by and check those out; you can borrow their ideas to use with your own kids. What do you think? This entry was posted in For Parents, For Educators, For Students, Tip Sheets on July 16, 2014 by Karyn Rashoff. 1. Model and encourage structure at home. There should be a pre-determined space for homework. It’s helpful if mom and dad present a united front for school expectations. Once kids learn they can play one parent against the other, the parents have lost the game. 2. Make love of learning a family affair. Let them see you reading books or doing internet research at home. Model “learning is fun” behavior. Let them know that their educational success matters to you. 3. Over-scheduling sometimes gets in the way of school success. Know your teen and set limits, making education the priority. Anything outside of school that gets in the way of education is a mistake. Some students can handle a lot more outside activity than others and thrive on having a full schedule, but others get distracted. 4. Car time is great because your kids are captive. Turn off the radio or phone and talk. You can go over vocabulary words (making funny sentences to use the words of the week), do multiplication tables, state capitals, whatever they are studying at the time. 5. You need to get involved as a parent if your teen isn’t achieving. Spend some time each day going over homework and returned papers. If they know you care, your kids are more likely to try a little harder. Talk to the teachers: they are a great source of information as to why your teen isn’t doing as well as you’d like. 6. The early years in school are the most crucial. Make it fun. If kids get excited about learning, it tends to carry through to high school and even post-secondary. Young children who view school as a place they have to go rather than a place they get to go are the ones who struggle later. This entry was posted in For Parents, Tip Sheets on July 13, 2014 by Karyn Rashoff. 1. Start strong during the first month of school each year by laying down the Rules of the Game to every class, but leave a little wiggle-room because if momentum trickles off later in the semester, as demonstrated by not turning in assignments on time or doing poorly on some (but not all) tests, the student has some cushion. This flexibility benefits both student and teacher: once kids get behind they feel overwhelmed, and even if they really try they may still only get to a ‘C’. But an opportunity to make up the shortfall is not only deserved, it can serve as a great motivator in later grading periods. 2. Organized notebooks help tremendously. Encourage your student to use color to highlight, underline and make symbols only they understand. Provide them with colorful tools. My seventeen-year-old neighbor uses the mirrored closet doors in her bedroom to make outlines, schedules and notes with colorful Dry Erase markers. It’s an entire wall of school stuff! 3. Don’t let your student cram-study on the night before a big exam. Instead, spread the study time over five days of shorter study sessions and re-reading during the week just before the exam. 4. Flash cards are great for certain subjects. Parents: don’t make the flash cards for your teens. The act of writing down the facts is part of learning. I tell my students to study the questions at the beginning or end of the textbook sections that might be covered in the exam. This entry was posted in For Parents, Tip Sheets on June 9, 2014 by Karyn Rashoff. 1. Teach time. Teens often don’t know what time “feels” like. Their evenings at home drag on endlessly with homework or they let the evening slip away without getting anything at all done. A digital timer or oven timer helps – let her have control over it. Cheerfully monitor her time but don’t hover. 2. You are his Wayfinder. Help your teen to clarify his path to success. Eliminate clutter from his life and help him get organized with his school notebooks, papers, backpack and binders. 3. Your home is a shelter from the chaos of the day. Help your teen study away from the TV, computer and other visual distractions. Keep her cell phone with you while she studies, but return it when she is done. This prevents endless distractions with texting. 4. Empower your teen. Set him up for success. Have clear family expectations about school success. Talk together about realistic hopes for his career, college and grades. 5. Don’t run interference, but be an involved parent. Allow your teen to solve her own problems without rushing in to rescue her. She is learning to negotiate the world now, and you are there to support and guide her in her learning to do this. 6. Make your home less crazy. Turn off unnecessary music, TV and computers until homework is done. Make your home as peaceful and quiet as you can to honor the time of reading and homework. This tells your teen that school is important. 7. Teach your teen to be a responsible person. Opportunities to serve the community are plentiful both in and outside of school. Let your teen choose what she wants to do and support her by your encouragement and praise. 8. You are your teen’s secretary. As a parent, you don’t need to know geometry or chemistry, but you can help him to get organized and stay on track with time at home and homework. Use a calendar together to view upcoming projects and assignments. Yes, in my counseling role I’ve been on the receiving end of lots of telephone calls and conferences of this kind. They’re not fun to get, but I do respect the intentions behind them. When there’s an apparent conflict between your student and a teacher, begin by reminding yourself that you are not your teen’s best friend. You are the parent. And as such, you must make difficult and adult choices for your teen. So the first issue for you is to understand both sides of the problem to arrive at a position to make a balanced decision on behalf of your child. Second, it’s not about you, and you must never replace your child with yourself as a participant in the dispute. But you are his sounding board, so listen to him without judgment of any kind. Simply hear him out and summarize what he’s presented to you in a way that will let him know that you’re clear about what he is saying. Doing this will send the message that you’re his number one cheerleader. However, this doesn’t promise that you will defend his position at all costs because that’s not always the truth, at least not at the moment you first hear about a ‘situation.’ Nonetheless, you may be surprised at his surrender to your hug or touch when you offer it after a tough day at school. Have a pen and paper ready to jot down information and names. Don’t call the school when you’re driving in your car or from any place where you can’t focus on the conversation and write things down. It’s best that you call from home, and at a time when there are no distractions like television or the presence of other children. “Quiet” and “private” are the words to remember as you get ready to call. Accept as a given that teachers, coaches, office staff and administrators have lots of experience in their chosen profession. They’ve seen and heard many different situations throughout their careers and are committed to assisting parents and students. They are not automatically ‘the enemy’ regardless of how your child views them. Before attending a parent/teacher conference, write down your questions and tell the teacher that you need to ask them before the conference is over. She’s with your teen five days a week, so use her observations objectively and try not to be defensive. 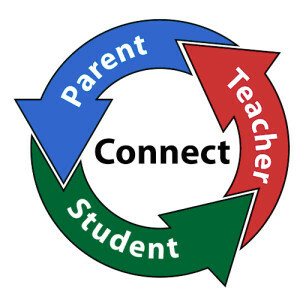 Give the teacher your phone number if she has a concern, can’t answer a question without further research, or simply wishes to call you at another time (which is the case during a parent night when a number of visitors may be waiting for her attention). Before you leave, make sure that your child’s teacher knows that your teen is very important to you and that you’re willing and supportive in working with the teacher to resolve any school-related problems. 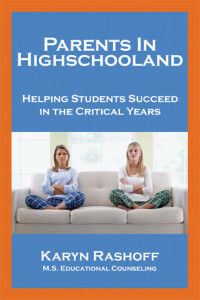 The aforementioned is one of the stories from “Parents in Highschooland: Helping Students Succeed in the Critical Years,” Karyn Rashoff’s caring and supportive account of thirty-three years of dedicated work as a high school guidance counselor. It is available as a paperback as well as an ebook, in bookstores, major book retailers and online booksellers, as well as directly from the publisher at www.BarkingDogBooks.com. 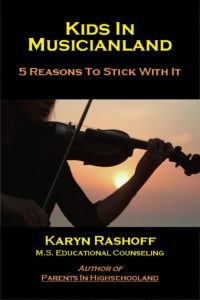 This entry was posted in Stories from the Book, For Parents, For Students and tagged parent/teacher conferences, single mom on August 25, 2013 by Karyn Rashoff.